Our daughter Olivia is 7 years old and vision impaired and coping with other issues, but it doesn’t stop her being happy and active. 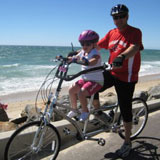 When she was 2, Olivia loved riding for hours in the child seat I fitted to my mountain bike. When she was about 6 and grew too big for the child seat, we were unable to source a replacement. 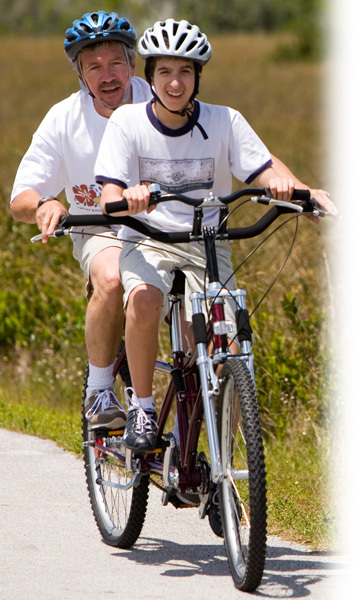 That is until we chanced on the Buddy Bike website. We knew immediately that this was not only a suitable tandem but it would also help her development. As she is not tall enough to use the pedals, we have at this stage set the bike up so her feet are resting on the static footrests. 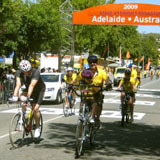 On the 23rd of January we participated in the 33km section of the 2009 Mutual Community Challenge, which took in several small towns in the Barossa Valley of South Australia. 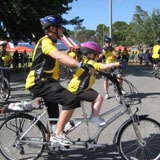 This is the public leg of the “Tour Down Under”, the “TDU” is a big deal in Australia - especially this year with Lance Armstrong competing - and was the event we wanted for our first major ride on our new Buddy Bike Sport which we had taken delivery of 3 weeks prior on New Year’s Eve. We lined up with 7,500 other riders on a pretty hot day and although we didn’t know how demanding the ride would be, we were excited. We had our official yellow jerseys on and Olivia was itching to get going. At 10am we all set off and Olivia and I were in the thick of it, with other riders in close proximity. Not pedaling didn’t mean Olivia missed out either. Coming down the other side of the first hill, everybody picked up a lot of speed. Olivia was looking left and right and she felt, heard and saw it all. She loved the other riders being close and nearly all of them shouted encouragement or “hello” - especially when they saw the little person was at the front. We were steering the bike together and having a ball. There were a few more hills which were fairly steep but we didn’t let them beat us, we only had to stop once and that was because it was so hot and we needed water. It seemed just when I thought I couldn’t pedal anymore, we would see the crest of the hill and I would find more strength in my legs and keep going. We kept up a decent speed on the levels and daddy’s legs got a break at the halfway point as we picked up a tailwind. That was definitely a reward for not giving up on the hilly bits! I had pumped up the Buddy Bike’s tyres to the maximum 65psi and we were rolling smooth and easy over the public roads and that allowed us to drink on the move. It was amazing to see so many people cheering on the side of the road, with a few envious looks from other children. The last 4 kms of the ride were uphill, but with Olivia urging me on, bouncing on her seat and waving to people on the side of the road who were also cheering everyone to the finish, I was not going to stop pedaling. The sight of the finish and the realization that I had completed the Challenge with Olivia, gave me a lift that took us across the finish line. My wife Sharron - Olivia’s mum - was waiting for us at the finish with high fives, food and drink and as our “official photographer” got some great pictures. It took us a little over 2 hours to complete the 33kms. It might seem a modest distance but the terrain and pedaling for two had made it a rewarding physical challenge. Hopefully next year Olivia will be tall enough to pedal the Buddy Bike with me and we might beat that time, but on this day she was so involved, so aware, and enjoyed the whole experience so much, I would do it again in a blink. The three of us will be back as a team in 2010.